This page is INCOMPLETE and still missing some important information before it can be used as a resource. Please use the "Discussion" feature above or talk to one of the tutors if you would like to help improve it. Thanks! This kitchen counter is currently being built by Aris and Manu for the TransitionHaus. 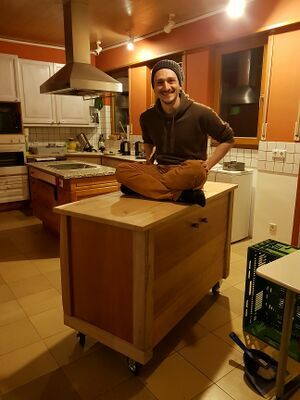 The almost finished kitchen counter with Aris testing its stability.